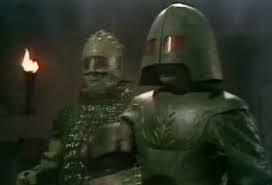 The Ice Warriors have always been one of my favourite Doctor Who monsters. This stems primarily from the third Doctor story, “The Curse of Peladon”, one of my all-time favourites. The first two appearances of the Ice Warriors in the sixties during Patrick Troughton’s time as the Doctor (“The Ice Warriors” and “The Seeds of Death”) were, to be honest, nothing special. 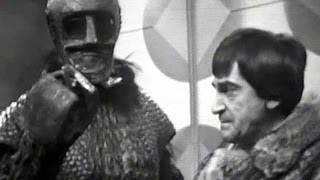 Both stories followed the standard second Doctor base-under-siege structure, with the Ice Warriors themselves being just another monster of the week, with little to make them unique or interesting, little to distinguish their characters as any different from the monsters that appeared in most of the other base-under-siege stories. “The Curse of Peladon” changed that. 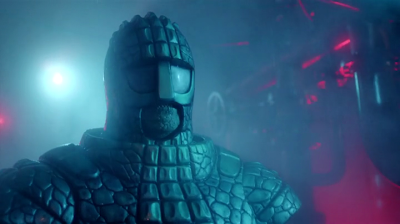 The Ice Warriors became a rare (for the time) example of an alien race in Doctor Who that wasn’t all bad. Suddenly, the Ice Warriors in this story were good guys. 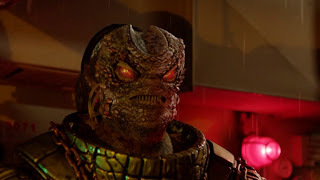 They were still the same species of creatures that had appeared in the previous stories, but suddenly, there was a lot more complexity to them, considerably more than appeared in most Doctor Who aliens. When they returned a couple years later in “The Monster of Peladon”, they were once again baddies, but this time specifically called out as a renegade batch. While “Monster” was nowhere near as good as “Curse”, it still developed the Ice Warriors in new ways whilst remaining true to what had come before. Then the Ice Warriors vanished from the show. There were plans for an Ice Warrior story in the missing season from 1985 (and given the novelization for that story that came out later, it’s for the best it was never made), and the Ice Warriors have been name-dropped a few times (such as in “The Waters of Mars”), but they’ve remained conspicuously absent from the screen (although they have appeared in novels and other spin-off media) until this week’s “Cold War”. I was somewhat worried about their return appearance after so long. Would the modern Ice Warriors be faithful to the originals, or would they be a drastic redesign like the Silurians? Even if they were faithful, would the story be any good? Given that Mark Gatiss was the writer of the episode, I had further reservations. Gatiss has a long association with Doctor Who. His first televised story was “The Unquiet Dead” in Series One of the revived programme, but even before that, he wrote several novels for the New Adventures series in the 90’s. Although I rather like “The Unquiet Dead” and his early novels, I’ve found his episodes since to be rather middling at best (such as “Night Terrors”) to downright atrocious (“Victory of the Daleks”). But in “Cold War”, Gatiss delivers his best episode since “The Unquiet Dead”, a story that manages to pay homage to the old base-under-siege stories, reintroduce the Ice Warriors in a way that is utterly faithful while simultaneously updating them for modern audiences, and stay suspenseful and exciting throughout. There’s nothing particularly clever or original about this story. When it comes down to it, it’s nothing we haven’t seen before, either in Doctor Who or various other shows and movies it’s lifted its influences from. But “Cold War” manages to be more than the sum of its parts, and ends up a very good Doctor Who episode, one that I enjoyed immensely. I commented last week that one of Doctor Who’s charms is its willingness to delve into wild and crazy ideas, even if they don’t always work. “The Rings of Ahkaten” is an example of this. “Cold War”, however, is an example of the show turning to its roots, to the tried-and-true. At its heart, “Cold War” is a base-under-siege story, a framework used repeatedly throughout Doctor Who’s history (particularly during the Patrick Troughton years, when it was overused, forming the frame of virtually every story in seasons four and five). The structure is very simple: An isolated group of humans (from a remote Antarctic base, a moon base, an archaeological expedition, a submarine, etc.) comes under attack from some monstrous alien threat. It makes a certain a sense to reintroduce the Ice Warriors in such a story, since it is in such a story that they first appeared. Of course, it runs the danger of just being a boring retread of that story and so many others, something the audience has seen countless times before, but Gatiss manages to avoid that here, and he does it in a similar way to “The Curse of Peladon”. He takes the Ice Warriors and everything associated with them, presents them completely faithful to how they’ve always been, but still adds new depth. Previously, when the Ice Warriors were villains, they were irredeemably so. When they were good guys, they were unquestionably so. In “Cold War”, Skaldak is the villain, but he’s a sympathetic villain, not beyond redemption. Skaldak is the first televised Ice Warrior with a character and history beyond his military rank and his role in the story. He has a past, including a daughter whom he mourns. Even Izlyr in “The Curse of Peladon” (the best developed Ice Warrior of any previous story) is not developed as well as an individual as Skaldak is in this story. Even though he kills quite a few people (which itself, as I will talk about in just a moment, is pretty shocking in recent Doctor Who), he’s still someone the audience can actually feel sorry for, even empathise with. The other thing that makes Skaldak work so well is that he represents a real, believable threat. I’ve commented before on how villains in Doctor Who these days often fail to do anything really villainous. The show simply expects viewers to accept that they’re villains because the Doctor or another character says they are or they make villainous ultimatums without following through on them. We rarely get to see them being villains. In my review last week of “The Rings of Akhetan”, I commented that the current production team seems very reluctant to have anyone die. Heck, people are rarely even injured. I suppose one upside to this, however, is that when deaths do occur, they’re very shocking. And boy, do we get deaths in “Cold War”! I don’t want to sound like I glorify in people dying violently because that’s simply not the case. However, villains need to do something to demonstrate that they are a threat. Programmes cannot rely on the audiences taking it in faith that there’s a threat. The threat needs to be seen. It’s the whole principal of “Show, don’t tell.” Skaldak killing several crewmembers without hesitation is one very effective way of showing the threat he represents. Of course, killing people isn’t the only way to demonstrate a threat, and Skaldak excels there too. He demonstrates intelligence by leaving his suit (even when he could have escaped with the suit) to move about quickly and unhindered in order to gather information about his enemies. It is incredibly refreshing to see an intelligent enemy who is a real threat on the show again. I was very glad that, in physical appearance, the Ice Warriors look virtually identical to how they’ve always looked and that a Silurian-like redesign wasn’t the route used here. About the only significant change is a replacement of the clamp-like claws with much more reasonable fingers. But the outer appearance aside, it was inevitable that, for today’s audiences, it would be necessary to show Skaldak out of his armour, something that never once happened previously. Indeed, the fact that the Ice Warriors never appeared out of armour even led some viewers to not even realize that the Ice Warriors were supposed to be wearing armour and to believe the armour was a biological shell (although this also meant having to rationalise the vastly different armour of the Ice Lords as being more than just a social rank difference, but also a biological one). Showing an Ice Warrior out of armour was necessary to establish that the armour really is armour. I’m a bit undecided, however, about their actual appearance out of armour. On the one hand, I like that they have a very non-human look. The spindly arms and fingers help a great deal in this regard. On the other hand, I’m not entirely sure what we see of Skaldak without his armour conforms with the shape of the armour. I may be wrong here as it’s hard to judge comparative lengths, but those spindly fingers look just a little bit too long to fit in the fingers of the suit. I was also not fully convinced by the CG effects. Of course, Skaldak isn’t the only thing in this story. There’s also the submarine crew. I’ve heavily criticised recent Doctor Who for not adequately developing characters, either regulars or guest characters, but in “Cold War” the characters are much better realized than usual. They’re still painted with a fairly broad brush and fall into certain stereotypes—there’s the experienced and well-meaning captain, the hot-headed first officer, and the eccentric scientist—but they nonetheless have personalities and motivations all their own, and exist as more than just vessels to carry the plot forward with (although they do a bit of that, too). There’s a great cast portraying them, too, from Liam Cunningham (Davos on Game of Thrones) to the wonderful, but sadly underused David Warner as Professor Grisenko. Grisenko is a fun character, somewhat Doctor-ish, and I’m very glad that he survives to the end. Clara has less of a role in this story than her two preceding ones, but I like what’s done with her here. Her sudden realization after seeing the dead bodies of the crew members is a pivotal moment. “It’s all got very real.” That one line moves her character forward in a very significant way (provided it is remembered in following episodes), as she realizes that travel with the Doctor isn’t all fun and games. There’s another intriguing moment with Clara, too. I commented last week that in the space of just a couple episodes, Clara has had just about as much character development as Amy got in two and a half years. However, despite that, there’s still a lot about Clara the person that we don’t know. Other than a desire to travel, what are her interests? What does she want to do with her life? “Cold War” doesn’t answer these questions, but it perhaps gives an unusual clue. When Professor Grisenko directly asks her what she likes to do, she says, “Stuff, you know, stuff.” Grisenko replies, “Stuff. Very likely.” Admittedly, this is the kind of thing that some people will actually say in response to these kinds of questions. However, I suspect there’s something more going on here, that Clara really doesn’t know what she likes to do—and more than just in the sense of people who haven’t yet made up their minds about what they want to do with their lives. Although the scene doesn’t hit you over the head with it the way the TARDIS scene last week did (with ominous music and a sudden change in lighting), it’s still fairly clearly sign-posted as a relevant moment. Clara has some unusual gaps in her knowledge (such as having no skill with computers and not even knowing the family’s wi fi password after living with them a year), and this would add to that, creating the suggestion that Clara isn’t entirely real. Doctor Who these days is not a particularly subtle programme; however, “Cold War” does provide a nice bit of subtext, juxtaposing the real-world Cold War with the situation on the submarine. It does hit you over the head a little with it—particularly in the showdown at the end between Skaldak threatening to launch the missiles and the Doctor threatening to destroy the submarine. Skaldak goes so far as to remind us of “mutually assured destruction”. However, it’s a fitting juxtaposition, and by presenting distinguishable characters on the submarine as well as making Skaldak a sympathetic villain, it aptly demonstrates that the real Cold War was not a stand-off between heroes and villains, but rather between people with different views. The cold in Cold War also ties in not-so-subtly with the ice in Ice Warriors. “Cold War” is not a flawless story. There are several things about it that don’t quite work or don’t quite make sense. Exactly why the sailor at the beginning chooses to thaw out Skaldak in the first place is beyond me. Even if Skaldak had actually been a mammoth, the decision still makes little sense (especially since the sailor dies right away and we never learn anything about his motivations). One could also argue that the resolution has shades of the “love conquers all” syndrome that has been prevalent in a lot of recent Doctor Who. And it’s true that there are hints of that, but it works much more satisfyingly here than in “Victory of the Daleks”, “Night Terrors”, “Closing Time”, “The Snowmen”, “The Rings of Akhaten”, or any of the other occasions when it’s occurred. It’s not so much “love conquers all” as it is a believable character (Skaldak) is convinced not to kill everyone. The story sufficiently develops Skaldak so that the viewers completely believe his decision in the end. Really, the only thing that makes the ending in any way problematic is that it continues an overused theme (one that has not generally been successfully utilized previously). I have to admit that, if “Cold War” had aired a few years ago, I probably would not have rated it quite so highly, as that was a period of Doctor Who that I was much more satisfied with, and this story might have even seemed like one of the weaker ones. However, there’s no denying that it is a very enjoyable story. It’s not original—most of its ideas are borrowed from earlier stories and movies like Alien—but it uses its subject matter in an engaging and suspenseful manner. Most importantly, it reintroduces and reinvigorates an iconic Doctor Who monster in a highly satisfying manner. Along with “A Town Called Mercy”, it is definitely one of the best episodes of Series Seven. I loved the reviews, and as a practical toddler in Doctor Who standards (let's just say I was not around yet to watch the old show) your perspective as someone who is familiar with the history of the ice warrior is interesting. I really liked how different this episode was from most in the past two seasons - the Doctor seemed to actualy be making a real effort to diffuse the situation with as little violance as possible. After the way he fought the Silence, this is really refreshing to see. overall a very solid episode, though. Always happy to see your comments on my reviews! I agree there are things that don't really go anywhere in the story. As I said in the review, the characters fit into fairly stereotyped roles. In the case of the hot-headed officer, his main role seems to be to let Skaldak know about the cold war and the missiles, giving Skaldak the idea to fire the sub's missiles. Since the officer serves no further purpose to the plot, Skaldak then kills him. It's very much a plot-driven moment instead of a character-driven one and it suffers because of that. Even though the character had a "purpose", it ends up feeling like he didn't because he ends up seeming disposable.